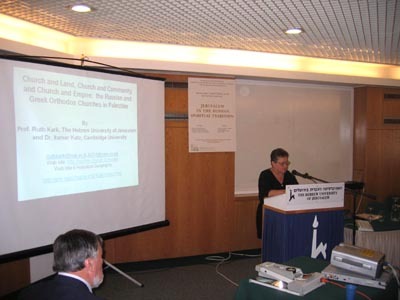 In this paper we consider the topic of church real estate in Palestine within the general contexts of Church and Land, Church and Community, and Church and Empire/State. The spatial distribution of the Russian church properties exposed its objective of putting down Russian roots in Palestine within the framework of its rivalry with other Great European Powers for influence in Ottoman controlled Palestine. Like other Christian groups, it purchased properties in areas of archaeological and historical significance: the monastery at Gethsemane and the Monastery of the Ascension on the Mount of Olives in Jerusalem, the Alexander Nayevsky Church in the Old City of Jerusalem, [Fig. 5:Russian Alexander Nayevsky Church in Old Jerusalem (Kark, 2005)] the chapel on the Jordan River, and the monastery in Tiberias. Within the framework of encouraging Russian pilgrimage to the Holy Land, hospices were constructed in Jerusalem, Hebron, Haifa, Nazareth, Jaffa, Jericho, and Ramleh. At the height of its activities, the Russian Orthodox Palestine Society operated 111 schools in Syria and 20 in Palestine in an attempt to compete and win the hearts and souls of the Arab Orthodox believers. In addition, two teachers’ seminars were established in Beit Jala and Nazareth. According to a Russian estimate dating from 1907, the value of only a part of these properties came to two million rubbles (£206,000). Conflict in the Galilee arose during the period when Russia attempted to attract the Greek Orthodox believers and in parallel have them rise up against the Patriarchate. This created conflict and motivated the Patriarchate to provide its followers with religious and educational services (83 schools), in all probability to prevent their leaving the Greek Orthodox Church for the Russian Orthodox Church or for other churches such as the Greek Catholic Church.